Private Van Service and Shared Ride Vans - a Shared Ride Van is a service where you can share a ride with others who are traveling to the same part of the city. It takes a little longer but it is less expensive than a private van. Karmel Shuttle Service - [View Prices] - Serves all major airports. Prime Time - Serves LAX, Burbank, John Wayne, Long Beach and Ontario airports. Super Shuttle - [View Prices] - Serves all major airports. Go Fly - Serves LAX, John Wayne, Long Beach and Ontario airports. Golden West Express - Serves LAX, Burbank, John Wayne, and Long Beach airports. LAX Airport Shuttle - Serves LAX, John Wayne and Long Beach airports. New Express - Serves LAX, John Wayne, Long Beach and Ontario airports. Right Way - Serves LAX, John Wayne and Long Beach. RoadRunner - Shuttles and limousines. Sav-On Shuttle - Serves LAX, John Wayne and Long Beach. Transtar Shuttle - Serves LAX, John Wayne and Long Beach. 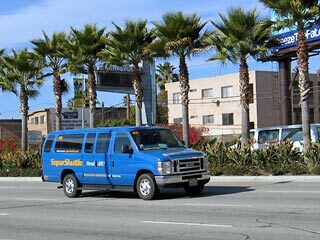 Xpress Shuttle - Serves LAX, Burbank, John Wayne, Long Beach and Ontario airports. Zippy Shuttle - Serves LAX, Burbank, John Wayne, and Long Beach airports.